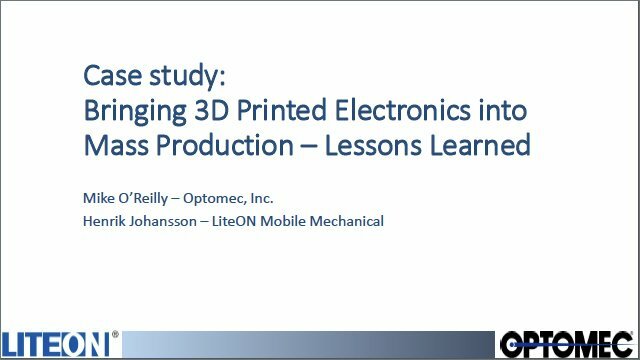 This webinar describes the use of Optomec’s Aerosol Jet 3D printing technology as a mass production solution at LITEON Mobile Mechanical for Smartphone antenna, sensors and other printed electronic devices. Electronically functional inks, substrate materials, the printing process and results, environmental testing and performance of printed devices will be covered. Additionally, we will discuss the motivations for the use of Printed Electronics as a manufacturing solution. The talk will highlight challenges and lessons learned bringing Aerosol Jet into mass production.